By the time José came to me, his reading challenges had been identified long since, and he’d had years of tutoring, and could decode word by word with some skill. He could translate letters into sounds, following the rules he’d learned, and then translate those sounds into ideas in his head—very slowly, with deserved pride in persistence. Nobody could mistake that for love of reading. José did love listening to stories read aloud. If he didn’t have to decode, if he only needed to make sense of the story he heard, his face was like a field full of the weather of the meanings, as they shifted. Every feeling in a story, he felt in his own body. If I asked the group, in discussion, to connect the events in the story to events in their own lives, what he said enlarged the story for us all. Meanwhile, he adopted one of the stuffed animals in the room, and dressed it in his sash from a presentation costume. 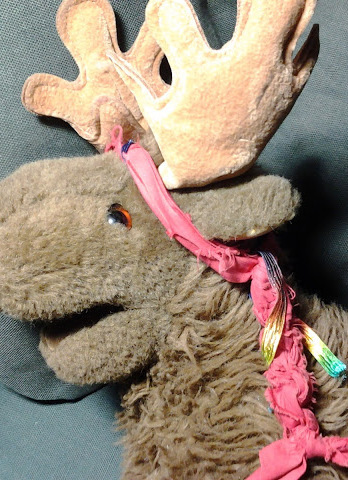 He gave Moosey a back story, and kept adding pieces of story as we moved through the year. He knew how to do this with big kid cool, from a place of high status in the group. He excelled at the collaborative, mutual storytelling we call friendship. What did José need most from his year with me? He needed fluency with print, with these tiny symbols, hard to distinguish visually, with which stories get told in the academic world for which he was headed. A child with extraordinary fluency as a social being, he needed fluency as a reader and as a writer. Various kinds of group instruction could be helpful, but more than anything, José needed time to practice those things he could do by rule; time to let these awkward constructions of skill become something more intuitive. He also needed help finding the books that would claim him and keep him reading. Because he was so sociable, I thought José would want books full of characters interacting. The book that clicked for him, though, was Hatchet, by Gary Paulsen. I just started to type a sentence about the loneliness of the challenged learner, then thought better of it. One way or another, we’re all challenged. Each of us has some way in which we are alone in the Canadian wilderness, when the pilot has had a heart attack and we’ve somehow survived the crash. Each of us knows some aspect of life in which we feel our way forward awkwardly, and only very gradually make sense. In the late spring of José’s year with me, when he’d read all four Hatchet series books in our own classroom library, we discovered that the school library had a fifth. José received it with his trademark enormous grin. He didn’t stay long to chat; he was off into a corner. When I come to José’s folder in one of my boxes, and find his list of books for the year, I grin pretty widely myself. There’s no guarantee that love of reading, once found, will last; but if it goes into eclipse, somewhere on a hard road to the end of school life, it can still bloom again. Skill is very good, but for the distance, if you have to last through the winter, love matters more. I want you to know that José and his mom gave me permission to use his name. (Moosey, too.) Today’s question, for anyone, but especially for you if you’ve faced reading challenges: is there a book, or series, that you fell in love with? How? When? Why? And then what happened? This entry was posted in Reading and writing and tagged Gary Paulsen, Hatchet, Moosey, reading and writing, reading fluency by pollybrown2013. Bookmark the permalink.